David Finckel and Wu Han performed a recital at Gusman Hall Saturday night for Sunday Afternoons of Music. In the classical music world, married couples who perform together often consist of one superstar bringing along a capable but less-than-musically world-class spouse. An exception to this rule is the duo of cellist David Finckel and pianist Wu Han, who performed Saturday at the University of Miami’s Gusman Hall, as part of the Sunday Afternoons of Music series. Both have their own careers, Finckel as cellist of the Emerson String Quartet, Wu as a highly regarded chamber music player. Together they were named Musical America’s Musicians of the Year for 2012. When they perform, the intimacy of their bond is clear. These are not simply two excellent musicians who happen to be married. 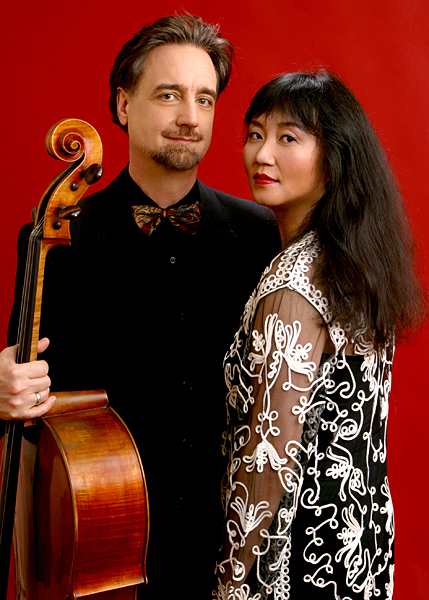 Their rapport was strikingly evident, as they watched each other play, breathed together, making eye contact as they held long notes before launching into the next passage, Wu often breaking into a smile as if pleasantly surprised by her husband’s take on a phrase of Schubert or Beethoven. They opened with the Adagio from Bach’s Toccata in C Major for Organ, transcribed for cello and piano. This was a dramatic, throbbing performance that was about as far from period authenticity as you could get, but it was already a transcription and they played it with a organ-like nobility and grandeur. In Schubert’s famous Arpeggione Sonata, Finckel gave a graceful, dexterous account of the memorable, quick themes that run through the work. Wu drew a light, almost harpsichord-like tone from the piano that matched the cello in these melodies. They delivered a big, athletic account of Beethoven’s early Cello Sonata No. 1 in F Major. Finckel brought an assertive tone to the square-jawed melodies of the first movement, avoiding a throbbing vibrato that would rob the work of its clean, confident tone. Wu adeptly handled the difficult piano part, her hands racing up the keyboard but never pounding, maintaining the work’s chamber-music balance. After the classical, music-room proportions of the Beethoven and Schubert works, Brahms’ Cello Sonata No. 2 in F Major came as a blast of symphonic romanticism. Finckel brought an intense urgent tone to the turbulent, almost endless melody of the first movement. Wu occasionally overpowered her husband, which may be more a result of Brahms’ dense piano writing than her performance. Wu had a way of imposing her will on the audience. Although she once waited quietly for everyone to settle down, in the Bach and Brahms works, she sat down and simply launched into the work at hand, forcing silence on the audience with the music, a particularly effective way to open the Brahms, which begins stormily as if in mid-phrase. And when members of the audience applauded between movements, she simply obliterated the noise by striking up the notes of the next movement. Usually when a violinist or cellist plays a concert of sonatas, they do so with the music on a stand in front of them. Finckel played entirely from memory, adding a sense of spontaneity to the performance and allowing him to focus on his partner’s playing. (Wu, who had a lot more notes to play, used music.) In the Brahms sonata, in particular, this seemed to add fire to the performance, as he tore into a tense passage in which notes alternately rapidly between two strings, as if he just felt like drawing those tones from his cello rather than just dutifully interpreting what was on a page in front of him. As an encore, the duo played the mock-sinister Allegretto scherzando of Mendelssohn’s Sonata No. 2 in D Major for Cello and Piano, a performance that was full of humor and personality and showed the full sonata might have been a good substitute for either the Beethoven or Brahms, both of which have been heard in this series just last fall.